We tend to associate hangovers with drinking too much alcohol – when we wake up with some version of not quite feeling ourselves. We may have more specific symptoms like a headache, brain fog, dry mouth, nausea, vomiting and general malaise – feeling out of sorts and below par. The word hangover can mean ‘something (custom, habit, feeling) that survives from what is past’ as well as the disagreeable physical effects from heavy consumption of alcohol or drugs. So in theory it could apply to the effects of food we have eaten in the last day or so that leave us feeling not so great. In recent years I have become aware that this hangover effect does not just belong to alcohol and drugs but actually does occur with food as well. Yes you hear correctly, I have experienced a hangover, in fact many hangovers, from food! What I mean is that what I ate yesterday, affects how I feel today, what I eat today affects how I feel tomorrow – such that if I over-indulge, eat foods that are not right for me, eat a meal too late at night, then I will wake up feeling not quite myself, out of sorts – maybe heavy headed, tired, brain fog, bloated, thirsty and overall difficulty waking up and getting out of bed. Whereas if I eat light healthy food, without over indulging, and at a suitable time for digestion – I wake up refreshed, feeling clear and light headed, ready for the day. Having been someone who used to eat everything and anything and think it had no such effect, this has been a major revelation to me. I previously would have dismissed and poo-pooed anyone who made such comments around the effects of food on our mood and state of being. So I understand others who think this is all crazy, wacky, weird and nutty as I used to do so myself. But I can no longer ignore what my body is clearly telling me – food matters – it doesn’t just pass through our bodies in a neutral way – it has a significant impact on our body’s health and our emotional health and overall wellbeing. Food affects our mood much more than I ever realised or imagined. It has been quite shocking to find how much impact it has. For example, if I eat certain carbs I will become sleepy, too much sugar and I become more easily irritated and fractious, too much salt and I get a headache and withdraw. After eating certain foods I will be more emotional or become easily upset – not just as a one off but this has been a pattern I have observed occurring consistently with certain foods. So whilst I might think I love certain foods my body is clearly telling me otherwise – the few moments of delicious taste in the mouth are offset by the longer lasting detrimental consequences of what I have consumed – to the point I have to ask is it really worth a few moments of pleasure in the mouth to then feel so awful for much longer thereafter!? Will I listen to the wisdom of my body or overrule it again and again?? And to be honest, I have a penchant for over-ruling it. 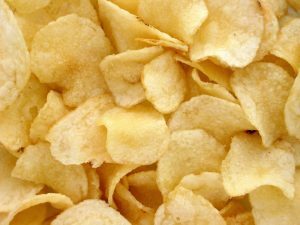 One part of me will say I love potato crisps – the crunch, the salt, the taste….mmmm …..and I can easily consume a family sized pack in no time at all. But my body tells another story the next morning….dry mouth, foggy head, bloated belly…..yet I can persist in repeating this despite the consequences…. Of course I have come to realise that this is only part of the story – as my desire to eat certain foods is not just because of their taste but because I know they will knock me out, make me sleepy, numb or heavy, less focused, distracted, racy and a host of other not so great feelings – but why would I choose that, you may well ask??? I am effectively anaesthetising myself, numbing myself in order to not feel something – maybe a hurt, sadness, loneliness, a feeling of not good enough, a tension from the accumulated stresses and strains of the day – rather than feel any of that I can choose one of the best numbing devices and vices we have – food! It is remarkable the games we play and the things we do in order to not feel. The ways are many and varied – even within food alone we can play all kinds of tricks on ourselves. Sometimes I choose to cut out a food that I feel is having detrimental effects – but it is amazing how I can find something else that is seemingly more healthy yet is actually having the same numbing effect energetically! It is the temporary numbing effect I am choosing over and over again – and to heal that I need to dig a bit deeper and be willing to feel whatever it is I am trying not to feel, whilst also realizing and knowing that I am not my emotions. No matter what the issue is, be it sadness or frustration or other emotion, there is always a deeper truth that knows I am love and not the sadness or the frustration or whatever it is I happen to be feeling…. and am trying to not feel by numbing myself with food! These emotions can be tricky because we get used to them, we can indulge in them, have a pity me party and want the world to take care of us – we play small, perhaps even feel we are a victim of life, where good things always seem to happen to other people but we get passed by? Sound familiar? The fact is we have much more responsibility for the quality of life we experience than we like to think! It’s easier to blame God, the Universe, Other People, Life itself for happenings in our life we do not like….than it is to say if this is happening in my life then I must have a part to play in it…..what is that part? And how can I change it? If I get back what I put out, what am I putting out? When it comes to food it’s as simple as ‘eat crap, feel crap’! What we put into our bodies affects not just our weight, but our mood, our energetic state of being, our demeanour – its effects are wide ranging and far more than we realise. If we want to feel light, healthy, vibrant, vital, joyful, steady and consistent in our mood and way of being then a great way to start is to really take stock (pun intended) of our diet and what we are fueling our bodies with and to feel the impact the food we ingest has on our bodies. The more we refine our diet, the easier it is to feel these effects – when I was heavy and used to eating everything and anything I denied that food had any of these effects, but as I became lighter, more aware, and dealt with the reasons for over-eating etc I was able to feel the effects different foods had more clearly. I had bludgeoned my natural sensitivity for so many years that it was easy to deny food could have such effects – refining my diet has allowed me to be more aware of my body’s natural sensitivity and to hear its messages. So whilst in the past I would have dismissed all of this easily, as woo woo, nonsense, quackery etc I can no longer deny ( much as I try sometimes!) the messages my body gives me when I feed it too much food or food that is not truly healthy for it. Food, (perhaps not so) glorious food, nothing quite like it for changing our mood! Indeed my efforts to overrule my body have given me plenty of experience of what happens when I don’t truly listen to and honour what my body needs….. such that I do not need a scientific study to tell me if certain foods are healthy for my body or not – for my body is the most sensitive science lab there is. It knows and it speaks loud and clear – I just need to listen and pay heed to its messages. Feel free to share your own experiences and observations of the effects of food on your mood and wellbeing….have you experienced a food hangover? I certainly have have felt a hangover from food – for me it’s sugar that always did the trick. If I ate sugar of any kind, my head would feel like cotton wool, I was not able to think straight and went around in a haze, not able to think clearly. It would take me 3 days to get over that. I love this article – it’s well overdue, for this issue needs fully exposing. True for me too, I’ve just not called it a hangover but it’s a great word for what happens after indulging in crap food! I’ve been known to have eaten a seemingly innocuous gluten and dairy free pizza, with fresh, local organic, healthy toppings, only to not be able to fall asleep for hours, then be woken up just a few hours later in the wee hours of the morning, feeling bloated, woozy and desperate for water. No different to what a hangover from alcohol has felt to me. I can very much relate to this. I also find that even eating the so-called ‘right’ or ‘healthy’ food at the wrong time or if I’m not genuinely hungry or if I’m out of sorts has a similar effect. . I know the food hangover too Eunice, having also experienced it many times. The remedy for me as you so beautifully shared is taking responsibility for stopping and being open to feel what it is I am trying to avoid! What is it that happened in my day that left me feeling I needed to ‘treat myself’ or made me feel uneasy so rather than look at my part I turn to food in an attempt to ‘switch off the feelings’ that are there. The upside of stopping before poking the next snack into my mouth has been to ask myself ‘why’ and further explore all the little intricacies and the patterns that I hold, offering a space to explore these more deeply and get to know myself at a deeper level and make the changes as I go. Of course a work in progress but always an opportunity to know myself more fully and get to know the food choices that truly support me. Yes – hands up from me too – I have had a food hangover, and whilst I have not had alcohol for over 14 years, I do recognise the symptoms – my breath feels stale and sweet (even if I havent eaten sweet food), my body feels dehydrated, I feel sluggish, and my bowels feel affected, in fact for the whole of the next day I feel out of flow, out of rhythm, and irritable too. There is a direct cause and effect – what we put in either harms or heals – some foods feel truly nourishing, and some foods, or the way I eat them dont feel nourishing. I definitely know the sleepy effect too from eating something too heavy or eating if I am not hungry or over eating, its like Ive had an anaesthetic and I go drowsy. I wonder how many of us consider this even when driving a car – food can also make us feel drowsy when driving for instance. Also, many years ago I used food as uppers and downers – tea and chocolate to keep me awake when I was busy or needed to drive a long distance, and I used curries, chips, rice to make me sleepy when I was too racy to go to bed – so if I ate a curry and rice that would anaesthetise me and put me to sleep. Definitely have felt the drowsiness that overcomes me when I am driving Jane, if I have over-eaten or especially if I’ve eaten heavy foods like carbs before hand and so if that is affecting me when driving my car then it is also obvious to me that it is happening anytime I choose to indulge in these types of food. A hangover with food, absolutely. I can very much relate to what you are sharing here Eunice. Even eating all the right food, but just that little bit too much, because it tasted so yummy, can cause a heaviness and sluggishness in the morning, making it a bit harder to get out of bed and starting the day all fresh and vital. What a great article, Eunice! As a big foodie myself, I can so relate to what you share here. And all the willpower in the world was not enough to help me control myself. It was only when I started learning to love and appreciate myself just as I am, for who I am as a person, not just what I do, that the insatiable craving for sweet foods started to ease. And now I find that I feel so lovely most of the time, that when I eat sugar, which I sometimes do, it actually has the opposite effect that it used to, and I feel sad, because it has taken me away from the natural sweetness I feel inside now.